Have you ever thought to yourself, “This tastes too good to be healthy?” Well, chances are you’re probably right. Advertisers and marketers have done a phenomenal job of selling their products to consumers under the assumption that they’re purchasing something healthy. Food manufacturers have made it convenient for consumers to purchase something readily made, so that we don’t have to go home and make it ourselves. Saves us time, right? Yes, but you know what that process usually involves? Lots of additional sugars and chemicals to help preserve the food, meaning more calories, and less nutrients for us. Most of these foods would be fine to eat if you were to make them from scratch yourself. But if you want the truth about which supposedly “healthy” foods you should really steer clear of at the supermarket, read on. It’s quite the fad these days to snack on protein bars. It seems like everyone and their dogs are eating them. They’re plastered all over magazine ads and television commercials. They’re supposed to help those on low-carb diets, and load you up with tons of proteins. Right? Well, sort of. Many of the protein bars on the market certainly have packed in the protein, but if you look closely on the nutrition label, you’ll notice protein isn’t the only thing they’ve packed in there. Read closely and you’ll see a huge list of artificial flavors, artificial sweeteners, sugar alcohols, and artery-damaging trans fats. 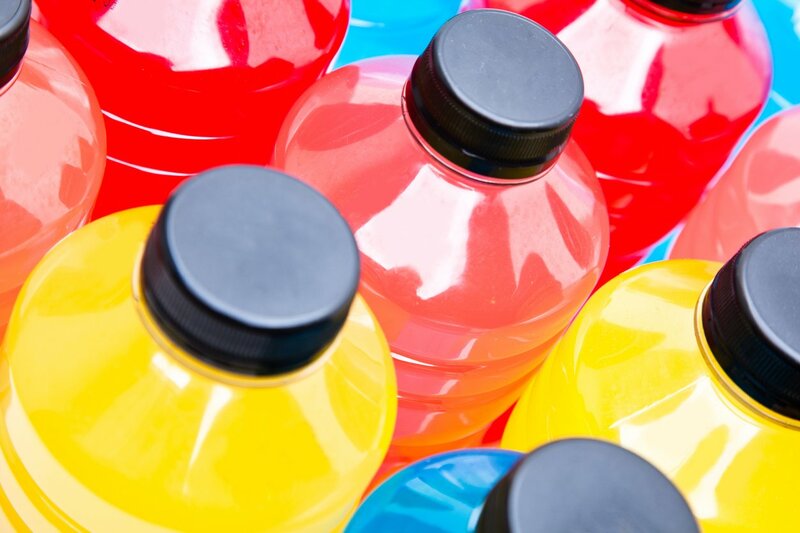 Sports drinks were actually developed for athletes to rehydrate them after their workouts. The drinks contain salts and sugars (lost during their sweaty workout) that refortify their bodies of from their extreme exertions. While it’s important to stay hydrated, most people are actually better off sticking to plain water and avoiding the excess salts and sugars found in sports drinks. Several salad dressings are packed with sugar, sodium, vegetable oils and trans fats, and many artificial chemicals. (Are you spotting a trend yet?) While store-bought dressings may be convenient, you would be better off to make your own out of lemon juice, olive oil, or apple cider vinegar. Even the low-fat bottled options usually have to make up for the taste by adding additional sugar. Because hummus is made from mostly chickpeas, it should contain a lot of protein. However, an average store-bought container of hummus has just 2 grams of protein and 100 calories for 2 tablespoons. That’s not very much protein. It’s actually higher in fat content and carbs than it is in proteins. If you’re looking to get at least 10 grams of protein, you’d have to eat 5 servings, or about 10 tablespoons to get there–which would also put you at about 500 calories just for a dipping snack! You can slap the word “vegetable” all over a package, but that still doesn’t make it healthy. Most “vegetable” snacks have little to no nutrition. They offer carbs, calories, and fat. Main ingredients usually call for potato flour, oil, and cornstarch. They’re not much better than regular baked potato chips. If you’re wanting a real veggie snack, try baking your own chips from kale or zucchini. Multigrain sounds nutritious, but it only means there are more than one type of grain in the bread. Many of these grains can be highly processed, too. Try looking instead for whole grain breads which has more fiber and antioxidants. Rice cakes have gained popularity because of their low calorie appeal. However, they lack fiber, protein, and healthy fats to help keep you full. (Not to mention the seasoned varieties contain extra sodium, artificial flavors, and calories). Don’t be surprised if you are still hungry for more food after snacking on a rice cake. In order for dried fruit to hold its flavor well, a lot of sucrose is added to store-bought varieties. The extra sucrose drastically increases the carb count, making them not so healthy after all. You’re better off purchasing a dehydrator and making your own. Nuts alone are a great way to add protein and healthy fat to your diet. Peanuts, walnuts, and cashews are especially good for you. Nut butters, on the other hand, contain a lot of sugar and oil. You may be initially shocked at this one. Aren’t all salads healthy? The lettuce itself is definitely healthy and low in calories, but when you order a Caesar salad, it’s usually drenched in caesar dressing, loaded with parmesan cheese, and covered in croutons (ahem carbs). Can you see how quickly this seemingly healthy dish can become so unhealthy? Stick to the lettuce and make your own dressing next time you’re craving a salad. Fruit flavored yogurts from the grocery store are full of sugars, corn syrup, and artificial sweeteners. If you’re looking for a healthier option, try plain yogurt, and add in your own toppings and seasonings (fruit, cinnamon, nuts, etc). Any food eaten in its original, natural, whole form, is the absolute best way to eat it. It contains the maximum amount of nutrition. When you change its form, you not only alter the taste, but the nutritional value as well. Canned vegetables especially have several amounts of sodium and sugar to help with preservation. If you can’t eat fresh vegetables, you’re better off freezing them. We all know Fruity Pebbles isn’t healthy and full of fruit. But even the cereals we see at the supermarket that have “made with whole grain” and other attractive wording labeled on it aren’t healthy either. Look closely at the food label to see the ingredients listed–those listed at the beginning have the most amounts, and those listed toward the end have the least amount. Cereals are just processed grains fortified with synthetic vitamins and minerals, not to mention they’re chucked full of sugar and sweeteners. Before we go any further, we should clarify that homemade smoothies made with fresh fruits and vegetables, are actually VERY healthy and nutritious for your body. The unhealthy smoothies we’re talking about are the pre-made or store-bought ones that have excessive sugars, syrups, and artificial flavors. While a good homemade trail mix with several nuts and seeds and unsweetened dried fruit is a great high energy and protein packed snack, many of the store bought options are not. They have extra sodium and sugars (think M&Ms…). Additionally, a small portion contains several calories, making it was to over indulge in a seemingly “healthy” snack. When it comes to your health, you need to be conscious of what healthy actually means. Many of these foods can be made healthy when making them from home using fresh ingredients. They only become unhealthy when they’re store-bought–suggesting that manufacturers have added sodium and sugar preservatives to help it last longer. (Just read the food labels). It’s junk food, not health food. Simple as that. Don’t be fooled. When it comes down to it, you’re better off making your own. Come improve your health at Kubex today with a Free One-Day Fitness Pass!